With its horizontal orientation, finely-balanced lead head, and plastic body molded over a gold hook, Custom Jigs & Spins’ classic Ratfinkee is one of the most effective jigs ever created. Fished shallow or deep, the Ratfinkee is hard to beat! The size 12 is probably the most effective lure for big ’gills in shallow water. The size 10 Ratfinkee is by far the most popular of all the Ratfinkee sizes and can be fished as deep as 20 feet with 2 lb. test line. The Ratfinkee works well with either a waxworm or spikes and shows up nicely on a locator because of its heavy, dense head. The size 8 Ratfinkee is a good choice for crappies since the hook will accept a small minnow. The size 6 Ratfinkee is perfect for larger fish or active perch and panfish. It will easily fish to 30 feet as will the size 4, which is a top choice for walleyes and bigger predators. It also works well under a tip-up since it can be used to present the bait in a horizontal profile. Ratfinkees are very effective lures for open water fishing, whether for shallow water bluegills, stream trout or walleyes. Since fish are more aggressive in open water, a size 8 Ratfinkee should be used on fish that would go for a size 12 through the ice. Crappies respond well to size 6 Ratfinkees dressed with minnows, suspended below slip floats. 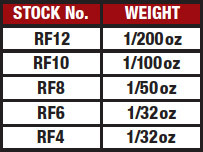 In fact, they will perfectly balance many floats because of their 1/32-ounce weight. Size 4 Ratfinkees have been used effectively for walleyes all the way from the Mississippi River to Canada. The secret is their light weight but large hook. They work best under slip floats or with a split shot 18-24 inches up the line. Effective bait choices are ’crawlers, leeches and various minnows. Trout can be taken with all sizes of Ratfinkees on a fly rod or spinning tackle. Magazine editors from In-Fisherman, Fishing Facts and MidWest Outdoors recommend a size 4 Ratfinkee for steelhead with salmon eggs, spawn sacs or a piece of yarn tied to the hook. 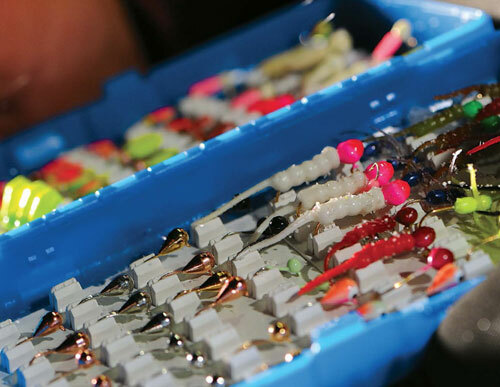 The bright colors and perfect balance makes the Ratfinkee 4 tops for drifting or float fishing. Rat Finke luminous and pink and Gold have quickly become a favorite Trout combo. I was turned on to The Rat Finke in Colorado. Paired with Red Mealworms and on a float simply found them exciting and provided the cornerstone of a week on landing CO. trout. Returned to Iowa matched up with wax worms on a float and the Iowa Trout action has been a guaranteed producer. Found just what my husband had been looking for! Excellent variety and price. Shipping/delivery was quick, received a couple days after ordering. Very happy with this seller & my purchase. Will be ordering again! Consistently produces trout in colorado. The glo heads have been best but this year the darker colors have worked too.